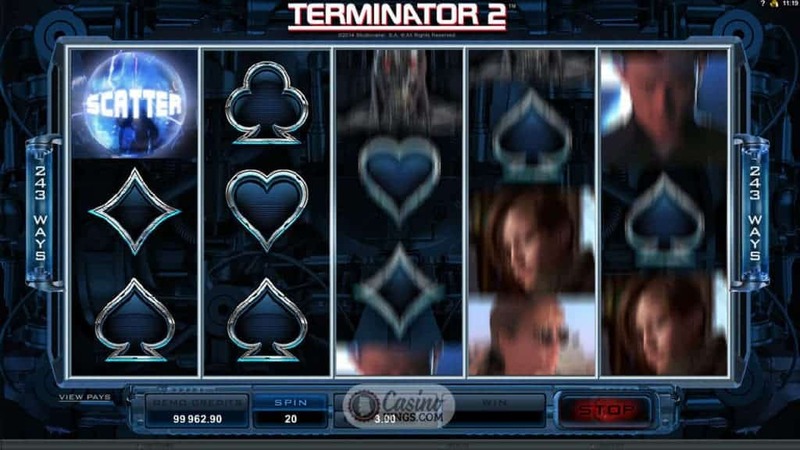 The Terminator 2 slot game will get your guns firing, especially if you are a fan of James Cameron’s 1991 sequel to The Terminator. 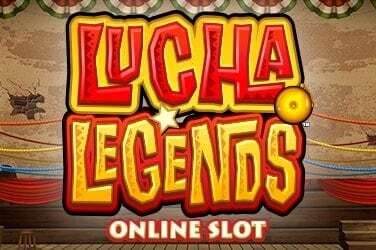 With that in mind you’ll no doubt be itching to train your sites at this slot. 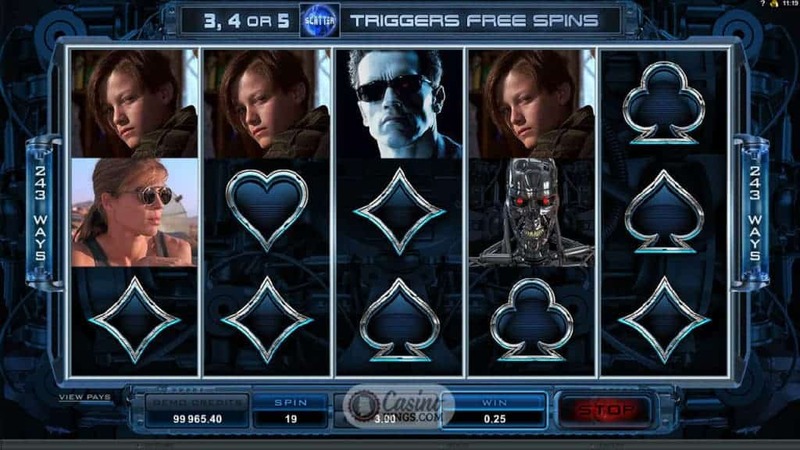 Let me tell you: you won’t be disappointed, more than that, this release from Microgaming is so playable it will grip slots players who aren’t fans of the original movie like the metallic arm of the Terminator himself. Trademark drum rattles and synth chords hum in the background as we spin the five reels – made up of futuristic diamonds, hearts, clubs and spades, plus iconic characters from the movie – John Connor and Sarah Connor, Arnie’s T- 800 and the murderous T-1000. As fans of the movie would hope for, we are treated to plenty of action clips when we land three or more characters across any of the 243 ways – left to right adjacent combinations of symbols with multiple combinations awarded per way. When we land five symbols the animations go into overdrive, my favourite being the T-800 endoskeleton glaring at us from within the flames: epic! 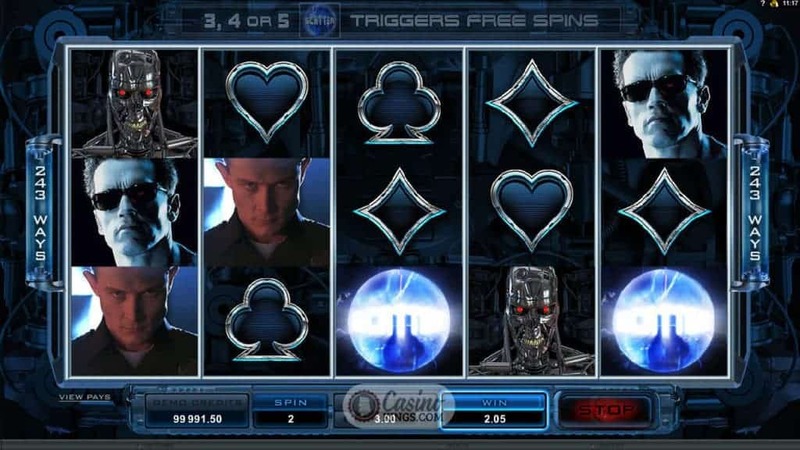 Three, four or five scatter symbols – the time travel electro spheres from the movie – trigger 10 free spins. 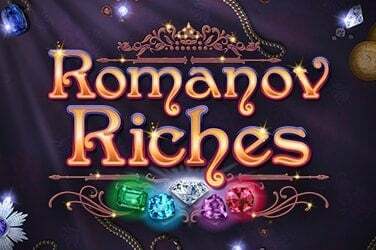 During the free spins game an extra row of symbols is added to the reels, enhancing the paytable to 1024 ways to win up to 88,000 credits. Just like in the movie the T-1000 can morph into any other character, but this time he will award the highest possible win rather than shafting a metallic blade down your gullet – bonus! 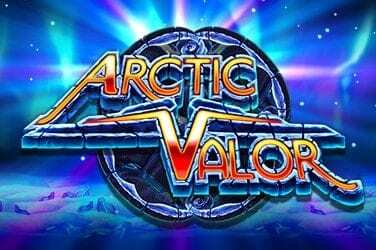 The theme music also blasts out throughout the free spins bonus round – ramping up the atmosphere and making it feel like you have been sent from the future to win some credits! A second bonus round, T-800 Vision, is awarded completely randomly. 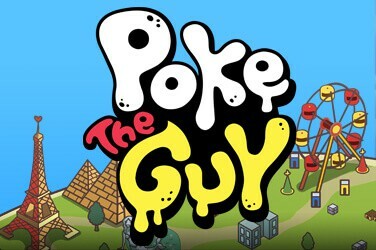 This is a welcome surprise when things aren’t going well, but when they are you kind of wish there was some reason or rhyme behind the bonus round. However, the random arm of fate does tie in with the themes of the movie, which is a nice touch, and in T-800 vision everything turns red as we set our sights on the other symbols. 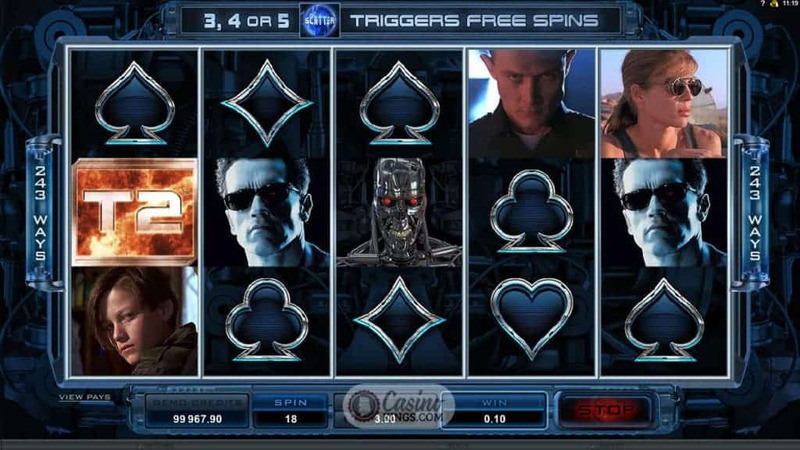 All high symbols pay mystery prizes and a single scatter will trigger free spins in T-800 vision mode.